Sarah Nader - snader@shawmedia.com McHenry's Megan Wiesemann (left) and Crystal Lake South's Sara Mickow jump for the rebound during the fourth quarter of Wednesday's game in Crystal Lake on February 1, 2012. 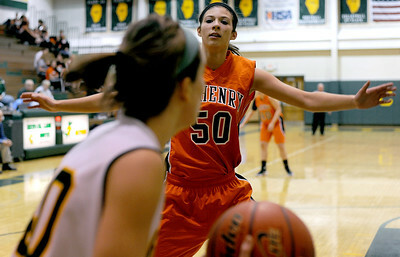 McHenry won, 50-41. 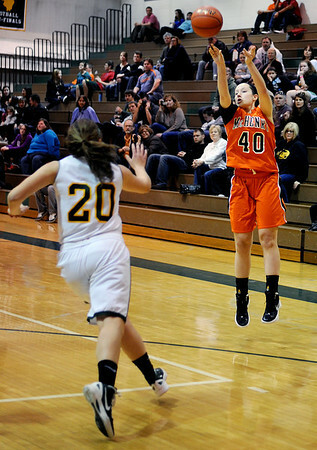 Sarah Nader - snader@shawmedia.com McHenry's Michelle Kelly (right) makes a shot during the fourth quarter of Wednesday's game against Crystal Lake on February 1, 2012. McHenry won, 50-41. Sarah Nader - snader@shawmedia.com McHenry's Megan Wiesemann (right) guards a Crystal Lake South player during the fourth quarter of Wednesday's game in Crystal Lake on February 1, 2012. 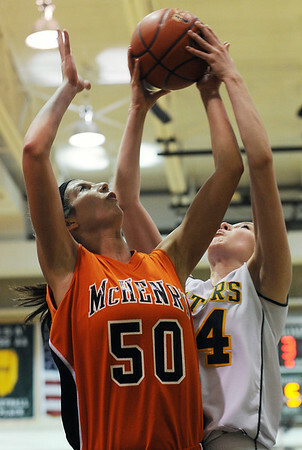 McHenry won, 50-41.